The villages of Cidjo and Bunkivane each benefit from the CongoAction Goat initiative run in conjunction with the local vet who is very committed to the programme. The scheme expects commitment from from its participants. 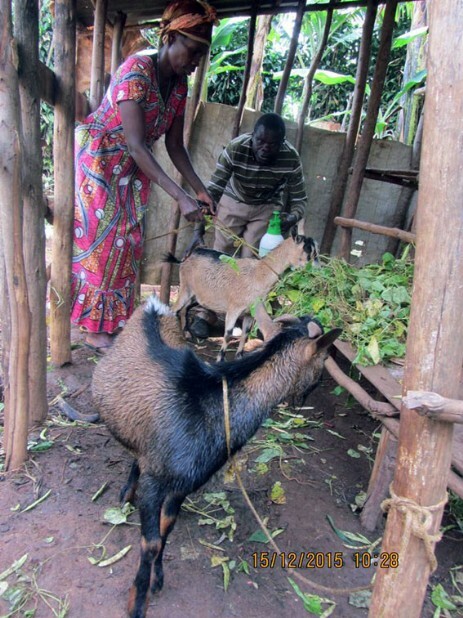 Before receiving a goat each must have undergone a training programme run by the vet, have built a small stable attached to his house and have access to foliage to feed the goat. They must also make a small contribution to the programme. Well over 15 stables have been built and more are in the pipeline. The project has now reached the end of its life as the villagers are now managing the distribution of goats to group members. One key factor to the success of this project was the provision of Congo Action money for vet fees and medicine. Congo Action feels that it is vital that money for vet's fees and medicine should continue, and we will give extra funds to the goup when these are available.